The Play Bluetooth Stereo Headset gives you easy control of music and calls, all with high performance digital sound quality, wireless streaming and earphones designed to isolate the noise from outside. Thanks to it's unique design, this headset gives you the flexibility you want and need. And with a minimum of 6 hours music time and 6 hours of talk time, you're free to go as far as you like. 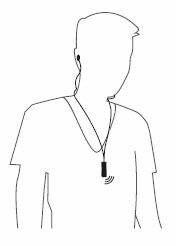 And just for kicks, the Play Bluetooth Stereo Headset connects to 2 Bluetooth devices simultaneously. → No pockets? No problem. The new Jabra Play is a high performance and stylish Bluetooth stereo headset that acts as a remote control to your phone. So you can play music and take calls anywhere while leaving your phone in your pocket. Just swing it around your neck and you’re on. → Jabra Play gives you easy control of music and calls, all with high performance digital sound quality, wireless streaming and earbuds designed to isolate the noise from outside. When a call comes in the device alerts you. With one tap you can take a call and once the call ends you can go back to enjoying your music with easy controls for volume and skipping tracks. → Thanks to its unique design, Jabra Play gives you all the flexibility you need. You can wear it the way you want - hang it or clip it on, you choose. Either way it’s guaranteed to turn heads. → With a minimum of 6 hours music time and 6 hours of talk time, you’re free to go as far as you like, without ever having to take your phone out of your pocket. 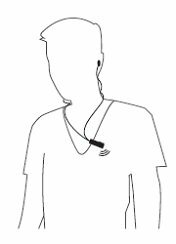 → Create a loop using the headphone cables, and wear around the neck. Adjust the lenght of the cable by moving the clip on the wire either upwards or downwards. → Clip-on to shirt for a more secure fit.